Most cookware in the market today is either made with aluminum or stainless steel, and this type of material needs to have a special type of steel plate attached to the bottom of the pan to make it induction cooking top compatible. Other types of materials for pans, such as cast iron and carbon steel, because of their material molecular make-up, do not need an induction plate. However, these type of pans are often sold uncoated and so have a reactive surface to some cooking ingredients, especially acidic, such as lemon juice or alcohol for example. 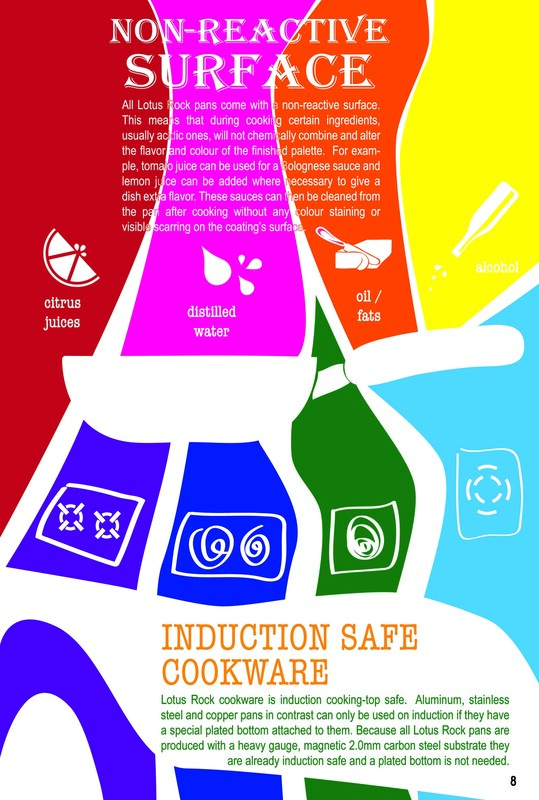 This can be disadvantageous for cooking, left-over odours can react with the cooked ingredients, or bad on aesthetic grounds, colour staining can impair the appearance of the pan. Lotus Rock cookware on the other hand has both a non-reactive surface (thicker and more heat resistant than most standard non-stick coatings) and it is compatible for all cooking top surfaces, including induction. This high versatility is one extra reason among many others to add a Lotus Rock pan to your kitchen cookware range.